Sunday, February 10 was an international day of protest against the Church of Scientology organized by a group calling itself Anonymous. Anonymous staged protests in major cities around the world to draw attention to what members describe as suppression of free speech and religious profiteering by the Church of Scientology. The most recent furor began several weeks ago after Gawker posted a leaked video of an interview with Tom Cruise where the actor extols the virtues of his kooky cult with maniacal intensity. Youtube withdrew the video purportedly due to pressure and threat of litigation. 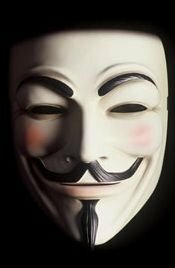 Enter Anonymous, an-you guessed it-anonymous group of tech-savvy activists who seek to undermine the Church of Scientology through subversive means by way of the internet. The group takes its ethos from the movie V For Vendetta and its masked, anti-establishment hero. In addition to its visible protests, the group has mounted denial of service attacks against the CoS, successfully shutting down their site on a number of occasions. Your correspondent took the weekend off from the ULC and happened to be driving by Seattle’s Scientology HQ and observe about fifty people dressed mostly in black and wearing Guy Fawkes masks while shouting and holding signs. King 5 has the story here.